The Revolutionary War was an insurrection by American Patriots in the 13 colonies to British rule, resulting in American independence. 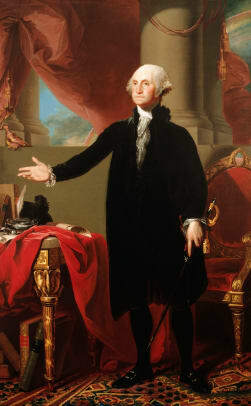 The Revolutionary War (1775-83), also known as the American Revolution, arose from growing tensions between residents of Great Britain’s 13 North American colonies and the colonial government, which represented the British crown. Skirmishes between British troops and colonial militiamen in Lexington and Concord in April 1775 kicked off the armed conflict, and by the following summer, the rebels were waging a full-scale war for their independence. France entered the American Revolution on the side of the colonists in 1778, turning what had essentially been a civil war into an international conflict. After French assistance helped the Continental Army force the British surrender at Yorktown, Virginia, in 1781, the Americans had effectively won their independence, though fighting would not formally end until 1783. 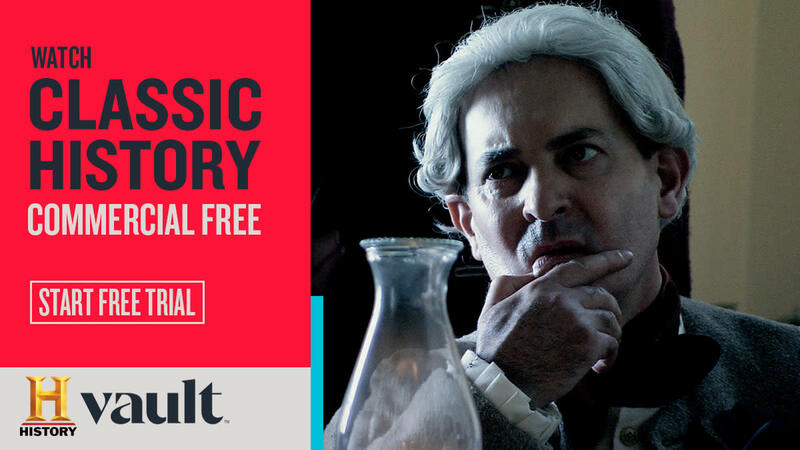 For more than a decade before the outbreak of the American Revolution in 1775, tensions had been building between colonists and the British authorities. 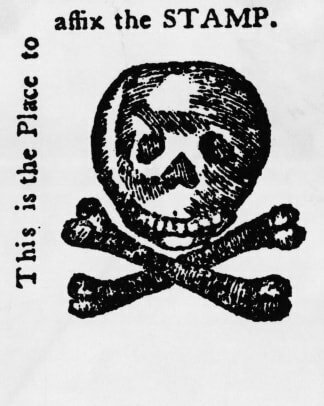 Attempts by the British government to raise revenue by taxing the colonies (notably the Stamp Act of 1765, the Townshend Tariffs of 1767 and the Tea Act of 1773) met with heated protest among many colonists, who resented their lack of representation in Parliament and demanded the same rights as other British subjects. 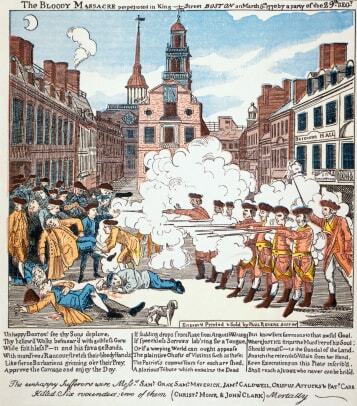 Colonial resistance led to violence in 1770, when British soldiers opened fire on a mob of colonists, killing five men in what was known as the Boston Massacre. 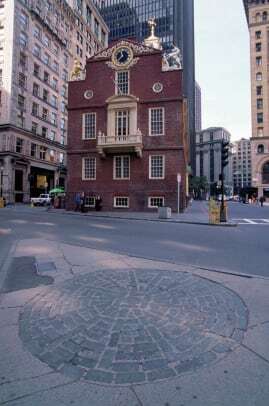 After December 1773, when a band of Bostonians dressed as Mohawk Indians boarded British ships and dumped 342 chests of tea into Boston Harbor, an outraged Parliament passed a series of measures (known as the Intolerable, or Coercive Acts) designed to reassert imperial authority in Massachusetts. Did you know? 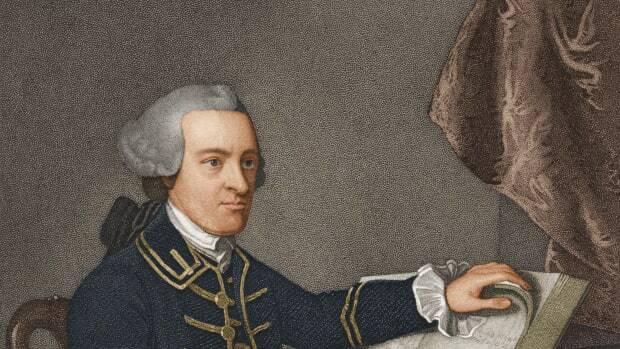 Now most famous as a traitor to the American cause, General Benedict Arnold began the Revolutionary War as one of its earliest heroes, helping lead rebel forces in the capture of Fort Ticonderoga in May 1775. 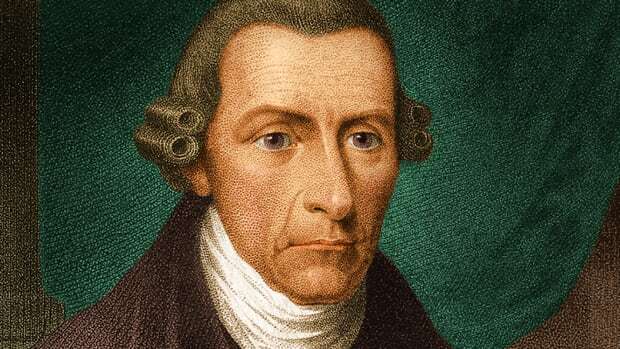 In response, a group of colonial delegates (including George Washington of Virginia, John and Samuel Adams of Massachusetts, Patrick Henry of Virginia and John Jay of New York) met in Philadelphia in September 1774 to give voice to their grievances against the British crown. 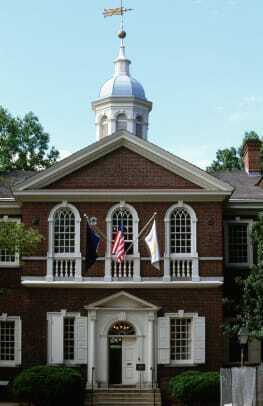 This First Continental Congress did not go so far as to demand independence from Britain, but it denounced taxation without representation, as well as the maintenance of the British army in the colonies without their consent, and issued a declaration of the rights due every citizen, including life, liberty, property, assembly and trial by jury. The Continental Congress voted to meet again in May 1775 to consider further action, but by that time violence had already broken out. On April 19, local militiamen clashed with British soldiers in Lexington and Concord, Massachusetts, marking the first shots fired in the Revolutionary War. 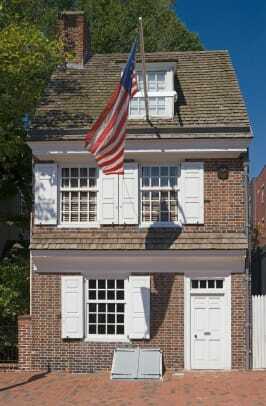 When the Second Continental Congress convened in Philadelphia, delegates–including new additions Benjamin Franklin and Thomas Jefferson–voted to form a Continental Army, with Washington as its commander in chief. 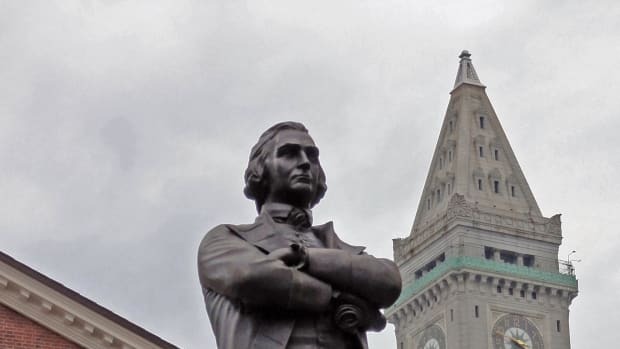 On June 17, in the Revolution’s first major battle, colonial forces inflicted heavy casualties on the British regiment of General William Howe at Breed’s Hill in Boston. The engagement (known as the Battle of Bunker Hill) ended in British victory, but lent encouragement to the revolutionary cause. Throughout that fall and winter, Washington’s forces struggled to keep the British contained in Boston, but artillery captured at Fort Ticonderoga in New York helped shift the balance of that struggle in late winter. The British evacuated the city in March 1776, with Howe and his men retreating to Canada to prepare a major invasion of New York. By June 1776, with the Revolutionary War in full swing, a growing majority of the colonists had come to favor independence from Britain. 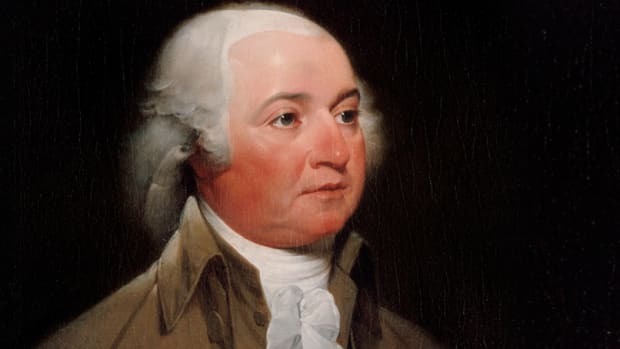 On July 4, the Continental Congress voted to adopt the Declaration of Independence, drafted by a five-man committee including Franklin and John Adams but written mainly by Jefferson. 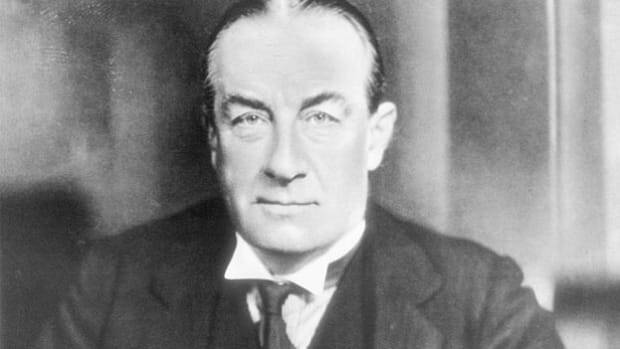 That same month, determined to crush the rebellion, the British government sent a large fleet, along with more than 34,000 troops to New York. 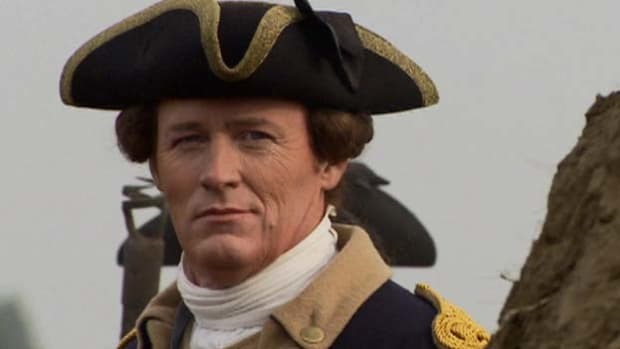 In August, Howe’s Redcoats routed the Continental Army on Long Island; Washington was forced to evacuate his troops from New York City by September. Pushed across the Delaware River, Washington fought back with a surprise attack in Trenton, New Jersey, on Christmas night and won another victory at Princeton to revive the rebels’ flagging hopes before making winter quarters at Morristown. British strategy in 1777 involved two main prongs of attack, aimed at separating New England (where the rebellion enjoyed the most popular support) from the other colonies. To that end, General John Burgoyne’s army aimed to march south from Canada toward a planned meeting with Howe’s forces on the Hudson River. Burgoyne’s men dealt a devastating loss to the Americans in July by retaking Fort Ticonderoga, while Howe decided to move his troops southward from New York to confront Washington’s army near the Chesapeake Bay. The British defeated the Americans at Brandywine Creek, Pennsylvania, on September 11 and entered Philadelphia on September 25. Washington rebounded to strike Germantown in early October before withdrawing to winter quarters near Valley Forge. Howe’s move had left Burgoyne’s army exposed near Saratoga, New York, and the British suffered the consequences of this on September 19, when an American force under General Horatio Gates defeated them at Freeman’s Farm (known as the first Battle of Saratoga). After suffering another defeat on October 7 at Bemis Heights (the Second Battle of Saratoga), Burgoyne surrendered his remaining forces on October 17. The American victory Saratoga would prove to be a turning point of the American Revolution, as it prompted France (which had been secretly aiding the rebels since 1776) to enter the war openly on the American side, though it would not formally declare war on Great Britain until June 1778. 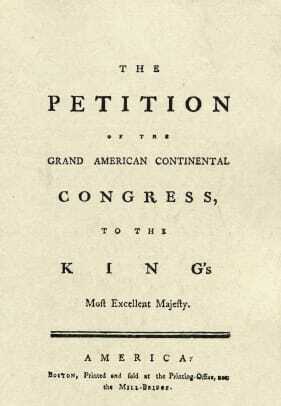 The American Revolution, which had begun as a civil conflict between Britain and its colonies, had become a world war. During the long, hard winter at Valley Forge, Washington’s troops benefited from the training and discipline of the Prussian military officer Baron Friedrich von Steuben (sent by the French) and the leadership of the French aristocrat Marquis de Lafayette. 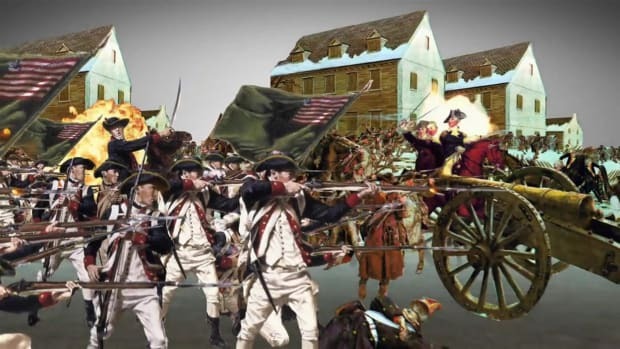 On June 28, 1778, as British forces under Sir Henry Clinton (who had replaced Howe as supreme commander) attempted to withdraw from Philadelphia to New York, Washington’s army attacked them near Monmouth, New Jersey. 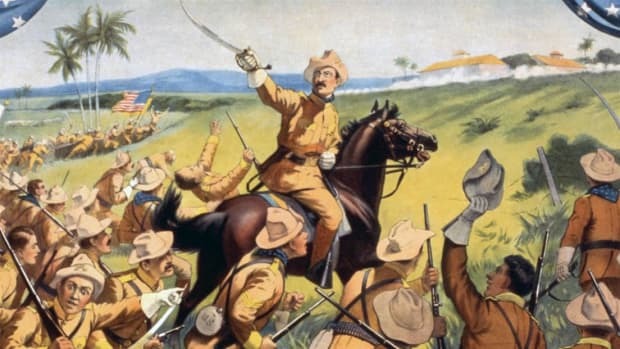 The battle effectively ended in a draw, as the Americans held their ground, but Clinton was able to get his army and supplies safely to New York. On July 8, a French fleet commanded by the Comte d’Estaing arrived off the Atlantic coast, ready to do battle with the British. A joint attack on the British at Newport, Rhode Island, in late July failed, and for the most part the war settled into a stalemate phase in the North. The Americans suffered a number of setbacks from 1779 to 1781, including the defection of General Benedict Arnold to the British and the first serious mutinies within the Continental Army. In the South, the British occupied Georgia by early 1779 and captured Charleston, South Carolina in May 1780. 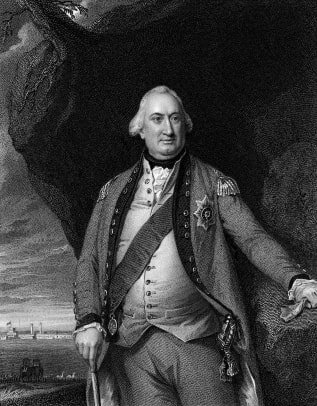 British forces under Lord Charles Cornwallis then began an offensive in the region, crushing Gates’ American troops at Camden in mid-August, though the Americans scored a victory over Loyalist forces at King’s Mountain in early October. Nathanael Green replaced Gates as the American commander in the South that December. Under Green’s command, General Daniel Morgan scored a victory against a British force led by Colonel Banastre Tarleton at Cowpens, South Carolina, on January 17, 1781. By the fall of 1781, Greene’s American forces had managed to force Cornwallis and his men to withdraw to Virginia’s Yorktown peninsula, near where the York River empties into Chesapeake Bay. Supported by a French army commanded by General Jean Baptiste de Rochambeau, Washington moved against Yorktown with a total of around 14,000 soldiers, while a fleet of 36 French warships offshore prevented British reinforcement or evacuation. 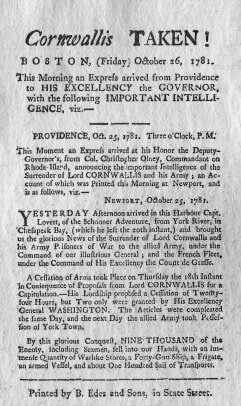 Trapped and overpowered, Cornwallis was forced to surrender his entire army on October 19. Claiming illness, the British general sent his deputy, Charles O’Hara, to surrender; after O’Hara approached Rochambeau to surrender his sword (the Frenchman deferred to Washington), Washington gave the nod to his own deputy, Benjamin Lincoln, who accepted it. Though the movement for American independence effectively triumphed at Yorktown, contemporary observers did not see that as the decisive victory yet. British forces remained stationed around Charleston, and the powerful main army still resided in New York. 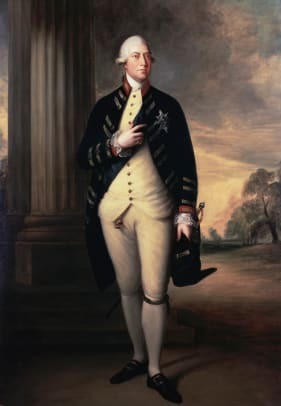 Though neither side would take decisive action over the better part of the next two years, the British removal of their troops from Charleston and Savannah in late 1782 finally pointed to the end of the conflict. 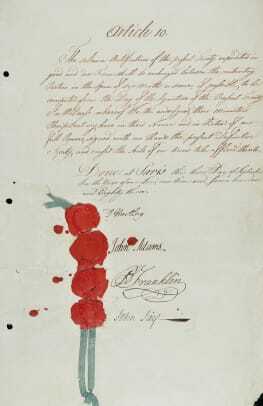 British and American negotiators in Paris signed preliminary peace terms in Paris late that November, and on September 3, 1783, Great Britain formally recognized the independence of the United States in the Treaty of Paris. At the same time, Britain signed separate peace treaties with France and Spain (which had entered the conflict in 1779), bringing the American Revolution to a close after eight long years.